Craft materials and equipment at discount prices. 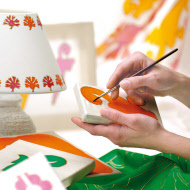 We supply professional artists, hobby crafters, schools and craft clubs. We have a reputation for good value, reliable personal service and excellent communication. Be creative in 3 dimensions with an enormous range of oven-hardening polymer clays and air drying clays. We stock the full range of FIMO and Sculpey clays as well as a large selection of tools and accessories. Choose from a range of themed silicone moulds. Cast items using Gedeo resins. Paint on silks using Setasilk and gutta from Pebeo. Decorate cotton and other fabrics with Setacolor paints. We supply fabric items ready for decoration. 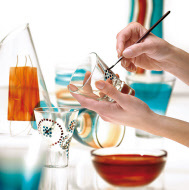 Use Vitrea 160 (oven set or air dry) or Vitrail (solvent based) to decorate glass objects and panels. 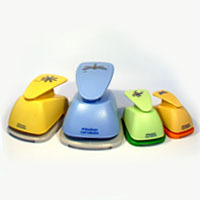 We stock a large range of Woodware Craft Punches. Also Spellbinders Dies, rubber stamps and inks. Pebeo Fantasy Prisme and Moon paints allow amazing creative effects.